50% of all heart attacks. In addition, as many as 78% of thrombi clots that may cause strokes, organ damage, or pulmonary crises) contain endodontic bacteria (i.e., bacteria founded in abscessed teeth requiring root canal treatment); 40% contained periodontitis pathogens. 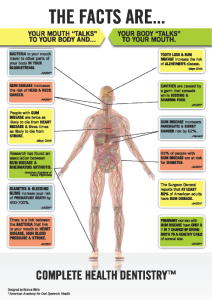 This research demonstrates a connection between oral and cardiovascular health. Good oral health keeps damaging bacteria from entering your bloodstream, so keep those pearly whites bacteria-free.